When you think of a casino, you imagine a place with lots of people, noisy slot machines, big and small wheels of the roulette table and tables dices are thrown. While these games are considered to be the real games of chance in the casino, there are also card games where you have to employ serious thinking and gaming skills to win. And one of the most popular, if not the most popular, card game is the blackjack. Since card games like blackjack require special skills to play, many gamblers venture to try their luck in this game thinking that the odds of winning is far better than in other games that rely mostly upon chance. Many skilled players, those with sharp minds and great math ability, do great in blackjack. But there is another type of skilled” players who sometimes get the chance to “laugh all the way to the bank”- the players who try to Blackjack Cheat. Card marking or the “Daub” Technique –using an invisible mark which the player sees using special lens. Card substitution or the “hold out” technique –using the palm to hold the card then substituting with a better card. Spooking or using another person who stands behind the dealer and “peeks” at the hole card and then sends the signal to the player. 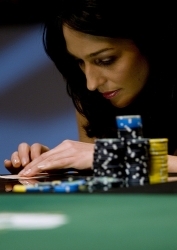 Sometimes some crude techniques are used by cheaters like usage of counterfeit chips or quickly adding chips to bet before the winning hand is paid. However, these actions can go unnoticed only if the dealer is not diligent with his job. And with modern technology like surveillance systems it is almost impossible to make use from this teqnique. There are also other methods which player can use that can also be considered cheating like knowingly breaking casino regulations and bend the rules in order to gain an edge over the casino. Among these methods you will find top hatting and post-posting which are both connectes with the assing of casino chips to the initial bet. The interesting fact is that there are about 30 cases of blackjack cheat at the most popular casinos all over the world – at Las Vegas and Atlatic City. But these are only those blackjack cheat, who were got noticed and arrested. Most of them are no the professional players, but novices or amateurs who try to win more. But blackjack game is not the one, which is intented to use cheating methods. Many casinos have adopted several measures to strengthen their protection and avoid losing out because of these cheaters. They have tighter securities now and use each available means to guarantee that they will not fall victims of the casino cheaters. However, the players themselves can also be at mercy of the dealers and they can be the one who could be cheated out of the game. But then again it is highly improbable that the dealer will be acting on his own and to make the casino lose and support the blackjack cheat.